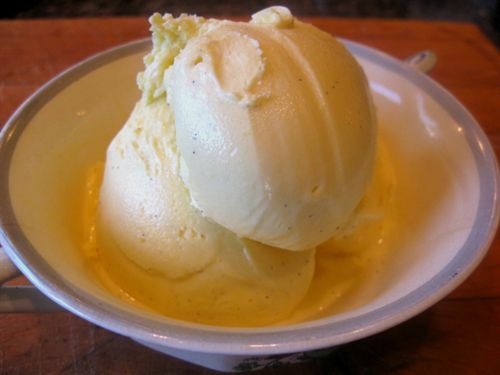 Donna’ extra-rich frozen custard recipe. Place milk and 1 cup of the sugar over medium-high heat in a 2-quart pot. Slit vanilla bean lengthwise with a sharp paring knife, scraping the seeds into the milk mixture (Note: If you like a stronger vanilla flavor, you can add up to ¼ tsp. of a high-quality vanilla extract to the milk in addition to the bean). Bring milk to scalding. Separate eggs (refrigerate whites for another use). Place yolks and remaining cup of sugar in the bowl of a standing mixer (a hand mixer works equally as well). Whip on highest speed until pale yellow and thickened to a ribbon consistency. Temper eggs by pouring some of the hot milk slowly into the mixing bowl at lowest speed. Pour all back into pot and cook on medium heat for another 5 minutes, stirring. Remove from heat and pour into a bowl. Stir in the cup of cream. Refrigerate until completely chilled (for faster cooling, place entire bowl in another larger bowl filled with ice). Following manufacturer’s instructions, pour chilled custard into chilled drum of ice cream freezer about 3/4” below rim. Freeze. (approx. 15-20 minutes for most makers). Remove from drum and place in freezer for about an hour. *Note on Snowville products: This is not an advertisement for Snowville, nor does Cincinnati Magazine have any affiliation. Simply, it is a fantastic, locally made product that I love and use in many preparations. Any milk and whipping cream can be substituted, but the results may differ. Make this recipe with Donna! Click here for step-by-step photo instructions.